This disregard for basic scientific facts might be less damaging if it were only relegated to tweets with sentence fragments and misspelled words. But a study just published by the Union of Concerned Scientists highlights how disdain for science has permeated the federal government. In its first two years, the Trump administration has waged an all-out campaign to shutdown scientific funding and research and sideline science-based policymaking at federal agencies, according to a report just published by the Union of Concerned Scientists. In “The State of Science in the Trump Era,” analysts document 80 cases of abuse, censorship, and cover-up at multiple agencies across federal government that, all told, demonstrate a pattern of hostility towards scientific inquiry and fact-finding on a scale and scope that is without precedent—with destructive consequences to the environment and public health. The report exposes a rampant practice of corporate favor and influence in government policies at multiple federal agencies, whether involving conflicts of interest, suppression of scientific studies, interfering with scientific input from outside experts, or efforts to rollback environmental and public health regulations, rules, and standards. Some examples include the rollback of the Clean Car standards and methane standards to benefit the auto and oil and gas industries, the suppression of an important report on the cancer risks of formaldehyde to benefit the chemical industry, and attempts to roll back regulations on coal mine dust to favor the mining industry even though scientific research makes clear exposure to such dust can lead to black lung disease. The administration has squashed a number of scientific studies when the findings of those studies didn’t align with its agenda. For example, when studies showed that Trump’s proposed border wall would threaten endangered species like the ocelot, political appointees who now hold key scientific positions dismissed those studies in order to support the administration’s contention that building the border wall would not negatively harm those species. In addition, the Department of Homeland Security has repeatedly waived federal laws that play a key role in protecting the nation’s environment and cultural heritage in order to clear the way for the administration to build sections of the border wall in ecologically vulnerable areas. Not only are scientific studies being dismissed, a number are not taking place at all. The federal scientific workforce is chronically understaffed—over half of the scientific leadership appointments in the federal government have not been confirmed. 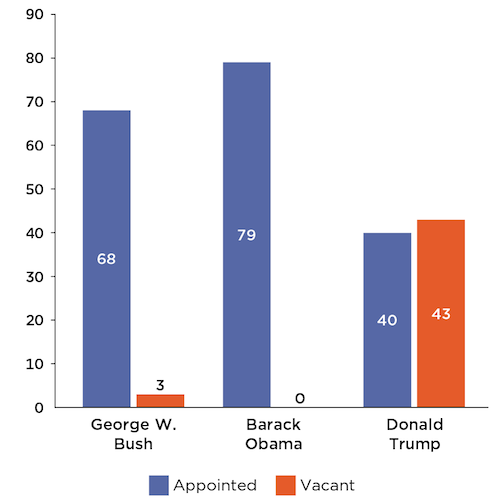 That number is dramatically low compared to the Bush and Obama administrations, which had filled all those positions before their two-year mark. The Trump administration has also conducted far fewer environmental reviews compared to the prior four administrations—only 237 environmental impact statements to date. That is the fewest conducted since before the George H.W. Bush administration, which conducted 311 in its first two years. A culture of scientific censorship has taken hold at agencies across the administration, whether it be restricting scientists’ ability to speak to the media about their research, or outright banning of certain kinds of speech, or even words. Last June, the Centers for Disease Control issued a ban on the words “vulnerable,” “transgender,” “evidence-based,” and “science-based” in budgetary reports. The Department of Energy prevented climate scientists from using “emissions reductions” or “Paris Agreement” in communications. Former Interior Secretary Ryan Zinke even called in Joshua Tree National Park superintendent David Smith to reprimand him in-person for a Twitter thread about climate change on the park’s official Twitter account. The administration has also disbanded panels that provide independent scientific expertise on issues that affect public health. Two scientific advisory panels on the impacts of air pollution, which has been linked to cardiovascular and lung diseases, were nixed. The vast majority of each of these “attacks” on science bear out the same narrative: a determined effort to favor the interests of industry, whether it be of fossil fuels, chemical, or mining. For example, Nancy Beck, a former executive with the American Chemistry Council who is now a political appointee at the Environmental Protection Agency, amended the EPA’s implementation of the Toxic Substances Control Act in an attempt to weaken regulations on asbestos. Some of Beck’s amendments used adopted language the chemical industry suggested. Meanwhile, the administration has continued to dismiss the science of climate change, even when its own National Climate Assessment, released last November, made clear that the United States is rapidly heading towards an environmental, economic, and public health catastrophe if we don’t stop burning fossil fuels. While the study paints a grim picture of a kind of systemic war on science, it also details how scientists and environmental and public health advocates have successfully pushed back on the administration’s efforts. In July 2017 for example, Trump nominated Michael Dourson to be assistant administrator of the Office of Chemical Safety and Pollution Prevention at EPA. Dourson is a toxicologist who has conducted industry-sponsored research that minimizes the health risks of chemicals. After a coalition of scientists, activists, and environmental and public health groups waged a fierce campaign opposing the nomination, Dourson was forced to withdraw from consideration. In another case, outgoing administrator Scott Pruitt, who resigned after numerous scandals emerged that he was abusing his office, pushed through an exemption for polluting “glider trucks” from penalties under the Clean Air Act just before leaving office. Environmental and public health groups like the American Lung Association, UCS, the Environmental Defense Fund, and others forced acting EPA administrator Scott Wheeler to reverse Pruitt’s decision. The Union of Concerned Scientists is calling on Congress to pass a Scientific Integrity Act to codify and protect the scientific integrity policies that are already in place at a number of science agencies. The Act would provide more protections to scientists to make sure they can speak to the media about their science-based work, insure that there is no political interference in their work and that scientific advisory committees are made up of a fair number of actual scientists, not just industry lobbyists, and prohibit political appointees and communications staffs from editing scientific documents, among other things.